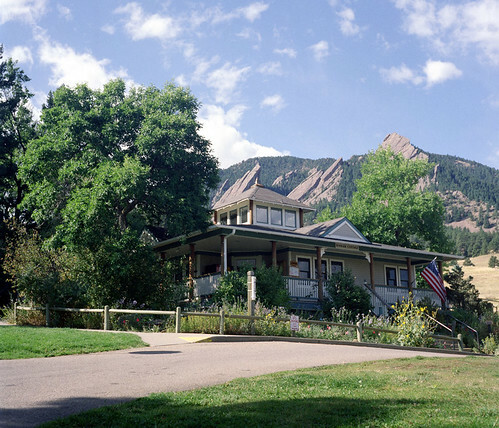 I’m volunteering again this spring at the native plant garden at Chautauqua Park. In front of the ranger cottage at the trailhead to Chautauqua Meadow, the garden provides a rich, blooming snapshot of the wildflowers found throughout the park. For those of you out of town, the park is no more than a mile from downtown Boulder, sandwiched between houses on one side and the Flatirons on the other. This photo shows our terrible working conditions. I mean, the scenery we have to put up with there in the garden! Our crew leader, the naturalist extraordinaire Dave Sutherland, likes to say that nature deals a different hand of cards each year. Some years the combo of wind, rain, and sun favors one set of flowers, other years another. This year we had a dry March, a cool April, and then weeks of rain in May. The golden banner was a little less happy with this arrangement. During most springs, the irises are found only in wet places—low-lying marshes, drainages, washes. But this spring the irises are everywhere, places I’ve never seen them before. They soaked up those May rains and are now partying like there’s no tomorrow. Turning down the Bluestem Trail, we began to pass the ponderosas. I can’t resist ponderosa bark up close. Press your nose to a crack in ponderosa bark, and enjoy a whiff of butterscotch. It was straight-up noon, time to head home to work on my book. Back at the trailhead next to the garden, I couldn’t resist yet another iconic picture of the Boulder Flatirons. I love where I live! Thank you for sharing your blog w/ your fellow gardeners at the cottage. Have you had a chance to hike the short trail in Heil Valley? There are some nice wildflowers there…We saw some of those lillies you included. See you soon at the cottage…. Hi, Lynn, the robin on steroids is the black-headed grosbeak. The robin sings, Cheer-eep, cheer-up, cheer-eep, cheer-up, short and repeated phrases. The black-headed grosbeak starts out that way and then keeps going, one long and complicated phrase that might include a buzz and a trill too. Very beautiful. See you soon!